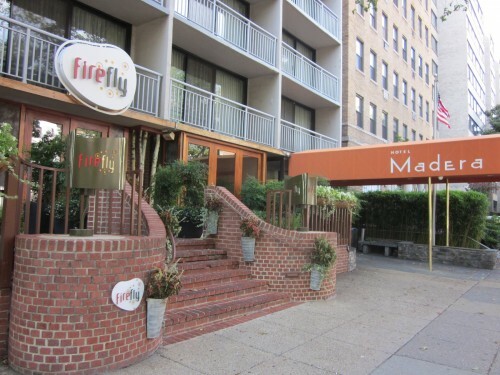 Renovation season continues with Firefly located at 1310 New Hampshire Ave, NW. After 10 years of operation, Firefly will undergo significant interior renovations for a refreshed look, and will close to the public on Monday, September 10th reopening for business on Saturday, September 29th. The design concept for the renovation was led by GrizForm Design Architects, an award-winning design firm based in Washington, DC. The intimate, rustic ambience of Firefly will remain, and renovation elements will stay true to the eco-friendly ethos of the restaurant, as many of the materials will be salvaged or recycled, and any scrap removed from the restaurant will be repurposed. “After ten years, we are thrilled that Firefly will be undergoing a renovation. Griz and his team are creating a warm, inviting aesthetic that will preserve Firefly’s atmosphere, but also give it some much needed modern upgrades, as well as add extra seating capacity” said Executive Chef Daniel Bortnick. The iconic tree will remain as a centerpiece of the restaurant, and will be updated with a swing that will hang beneath the tree branches. The kitchen façade will be transformed to look like the outside of a cottage, featuring salvaged windows, through which guests will be able to see Chef Daniel Bortnick and his team at work in the kitchen. The design team, led by Griz Dwight AIA, will incorporate materials such as various new and reclaimed woods, a color palette that includes greens, oranges, browns and rusty reds, as well as a custom designed ceiling emulating the ethereal light of a firefly. “The concept enhances the Firefly brand by reimagining the kitchen as a house at the edge of the woods and the dining room embodying the mood of a country field at dusk,” says Dwight. The renovation will also allow for a total of ten additional bar and lounge seats to be added, including an additional high top table in the bar area, three additional bar stools, and three additional lounge tables. With the additional seating, the renovation will also be taking measures to sound proof the restaurant, using vinyl-wrapped sound panels on the back wall as well as using Acousti-Coat sound reduction paint on the ceiling.